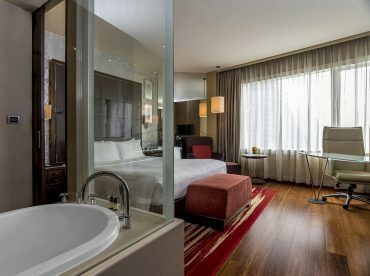 With 38 sq m of stylish living space and views of the city, Pullman Bangkok Grande Sukhumvit’s 187 Deluxe Rooms were designed with the traveller’s well-being in mind. And thoughtful layout makes use of every inch of space. Fitted leather furnishings and a subdued colour scheme set the tone for a stately stay in these bold and contemporary rooms. An impressive headboard compliments the kingsize bed. See-through bathrooms (fitted with blinds and doors for privacy) offer the choice of a leisurely bath or an invigorating rain shower.